Dorothy Broadbent, was a devout and lifelong member of St. Paul’s Presbyterian Church where she was actively involved in many aspects of church life, especially the Women’s Missionary Society. Mrs. Broadbent was also a faithful volunteer at, and supporter of, St. Peter’s Hospital and the Canadian National Institute for the Blind. F. James Travice Broadbent, a chemist by trade, came to Canada from Huddersfield, England in 1992 as representative of a dye manufacturer. At the time of his retirement, he was associated with Hoechst Canada and Hoechst Celanses Corp., in the U. S. He was a devoted member and a Perpetual Deacon of the Anglican Church, serving in many capacities in the local, provincial and national levels, and was Honourary Assistant at the Church of St. Thomas. Mr. Broadbent was active in both Masonry and Scottish Rite, and served for more than 20 years on the Board of St. Peter’s Hospital. For about thirty years, Marjorie Lillian Allan was the friend of thousands of students and their teachers as secretary at Delta Collegiate, a position previously held by her sister, Dorothy (Broadbent). Active in volunteer work, she was a member of the Women’s Missionary Society of St. Paul’s Presbyterian Church and, with her sister, devoted many hours to visiting patients at St. Peter’s Hospital. Terry Yates is one of HCF’s longest-serving volunteers. In this 2014 video he discusses the importance of community philanthropy and his view of HCF’s strengths. James St. North and Cannon Street West represents two landmarks: a new home for Hamilton Artists Inc. supported by the first investment from HCF’s new community investment fund. Canadian charities have historically had difficulty finding financing for expanding services and facilities. Lack of funding for core operations, growth and diversification inhibits what they can accomplish. The Hamilton Community Investment Fund is a $5 million fund that invests in local charitable and non-profit projects – instead of the stock market. This amount includes $2 million available as loans to the sector, through a partnership with the Community Forward Fund, an innovative loan and investment organization that provides financing for financing charities and non-profits. “We expect community investment to go beyond traditional granting and fill an important gap that will help to strengthen the charitable sector and the city,” says Terry. “The Inc.” is a long-standing artist-run centre that supports and reflects the diverse environment of the community. A loan from HCF’s Community Investment Fund allowed them to complete the building project on time while awaiting promised financing that had been delayed. 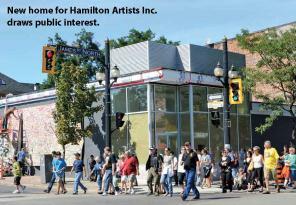 Read more about community investing at www.hamiltoncommunityfoundation.ca.